All-in-all, I've found the Bakfiets to be well thought out and constructed. One area has always seemed lacking to me, though: the seatbelts for the bench in front. There's a strap for each shoulder, coming together into a single buckle in the front that passes through the child's legs. 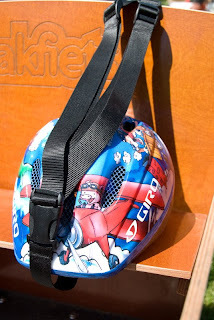 The issue we've run into is that when the straps are adjusted short enough to fit my son's shoulders (he's 21 months), there's not enough room in the "loop" for his helmet to fit through. This has meant that he has to go into the cargo box and be buckled before his helmet goes on, and the helmet has to be removed before he can get out. We like to cruise around the neighborhood on weekend mornings, and this has made it difficult to hop out for a few minutes to wander through a yard sale or pet a friendly dog. What a hassle! And every time that helmet goes on, it's another chance for a bad pinch by its buckle on his chubby little neck if I'm not careful enough. I don't need that kind of stress. Enough was enough, it was time for a new strap. Browsing through strapworks.com, I found what I was looking for. 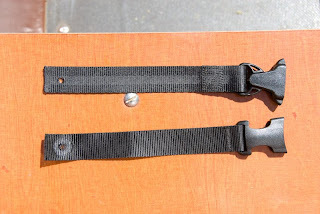 A split release buckle would let me separate the shoulder straps. 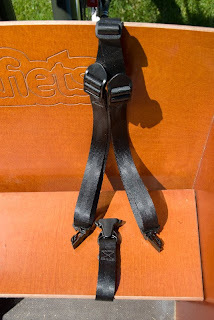 The factory belts themselves had always seemed a little stiff, so I opted for 1" seatbelt webbing for my version. And a strap adjuster would serve just as its name implied. Now, if you were crafty enough, it would be a piece of cake to order the pieces and sew them yourself, but sewing isn't my craft of choice. So I spoke to David in the custom department at Strapworks. After faxing in a waiver that I wouldn't hold them responsible if anything bad happened, he gave me a great quote for the entire finished set. Each shoulder strap would be stitched to a strap adjuster, and the leg strap would be sewn to the bottom of the split buckle. Three days after my order (they're not too far away in Eugene, Oregon), the straps arrived. I had ordered them extra-long so that I could cut them to size, but if you order your own and want to match the dimensions of the existing system, the shoulder straps need 30" of webbing and the leg strap needs just 8" (total length after sewing - add maybe an inch-and-a-half to loop back and sew). 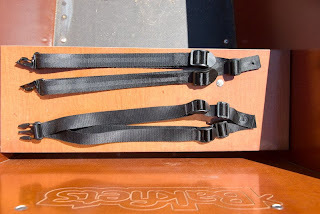 You could even order just the split-release buckle and its strap, and re-use the existing shoulder straps but threaded through the new buckles. I removed the old straps and used them as a guide to cut the new ones to length, melted the ends on an iron to keep them from fraying, then melted a hole through the webbing with a soldering iron for the bolt hole. The new straps went right on without a problem. If I hadn't been taking pictures, it would have been around 5 minutes to do the swap. Finally, here's the new belt installed: The boy is napping right now, so we haven't even had a test fit, but I'm sure it will work great. 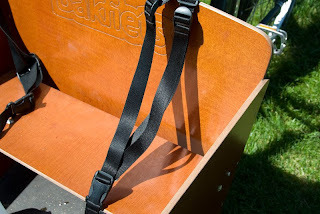 They buckle and unbuckle easily, and the belts are so much softer. I might even add some slip-on shoulder pads from his old car seat. What luxury!